Having a vision doesn’t make us better, but living that vision does! So what is NuVox’s vision? To be the market leader in delivering communications solutions to business customers. Sounds simple. But how do we do it? By developing solutions for our customers and then taking care of our customers. 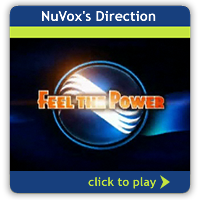 What gives NuVox the edge? From the small business with just a few lines, to very large businesses requiring everything from voice and data, to internet security and private networking, we're here to keep you connected. Because Business is on the Line.